Report says Sara Netanyahu slammed bereaved parents for inviting arch-rival Ayelet Shaked to a memorial for Hadar Goldin: "Ingrates"
A new report says that Sara Netanyahu angrily berated the bereaved parents of Hadar Goldin for inviting the prime minister's political rival, Justice Minister Ayelet Shaked, to the memorial service. Hadar Goldin was killed in Gaza during 2014's Operation Protective Edge. His body has been held by Hamas ever since. According to the blockbuster Channel 10 report, Sara was infuriated after seeing that Shaked was invited to speak at the memorial, and accused the Goldins of attempting to undermine Prime Minister Netanyahu. "You are ungrateful. 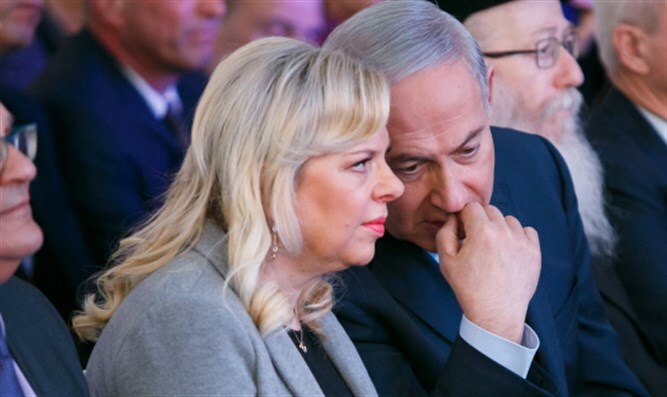 Your connection to my husband's opponents may harm the prime minister's effort to return Hadar to Israel from Hamas," Sara Netanyahu reportedly told Leah Goldin. Stunned, Goldin returned to her guests, who noticed the obvious turmoil that she was undergoing after being scolded by the premier's wife. Sara Netanyahu denied the veracity of the report in a statement. "It never happened," the response said. "There was never such a conversation. Sara Netanyahu came to console the Goldin family and arrived together with the Prime Minister to visit an exhibition of paintings by Hadar that was held in the Artists Village in Ein Hod and participated in other events." "Hadar Goldin and [fellow fallen soldier] Oron Shaul are in the hearts of Sara Netanyahu and the prime minister, and any other statement is incorrect and does not reflect the connection that was created with the family." Sara Netanyahu has had a famously hostile relationship with Shaked. Once a close aide to then-opposition head Binyamin Netanyahu in 2006, Shaked and Naftali Bennett had constantly fought with Sara and were eventually pushed out. The two moved on to helm the Jewish Home faction, but the relationship has remained frosty ever since.